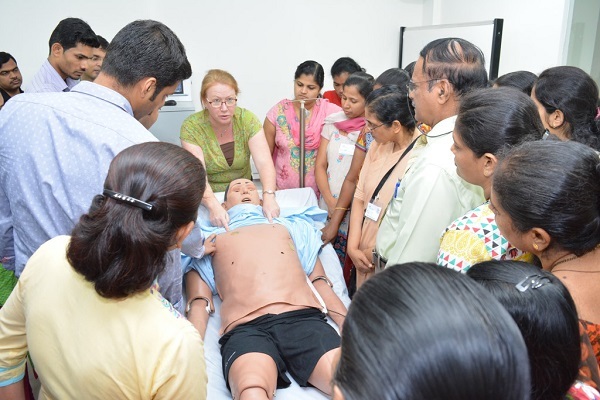 Committed to evidence-based simulation training with supervised instruction, the Father Muller Simulation and Skills Centre in Mangalore/Mangaluru India is dedicated to patient safety. The Father Muller Simulation and Skills Centre houses full scale, high-fidelity simulators for educating students in maternal fetal care and adult patient care. FMSSC also has interventional simulators for laparoscopy and cardiac ultrasound training. The center's vision is to be a world class leader in simulation-based medical education (SBME) by utilizing innovative methodologies that improve the quality of healthcare and to reinforce the highest level of performance among its learners within a realistic, yet safe training environment. Established in late 2015 and inaugurated in March 2016, the Father Muller Simulation and Skills Centre of the Father Muller Charitable Institutions in Kankanady, Mangalore India (Mangaluru ) is state-of-the-art. It is the first functioning advanced healthcare simulation center in Mangalore. Watch the video to see this amazing new center for SBME. Simulation is entrenched in medical education all over the world. Even in India, medical education has progressed. Students learn by doing, not by reading. Application of knowledge is very important, rather than just learning facts for the sake of learning. Patent safety is of the highest importance today. Everything should be, and must be, done to keep patients safe. Medical training through simulation is proving to be one of the most important, innovative, and relevant modalities for achieving that goal.